NYC, 02/26/2019, 7:00PM. 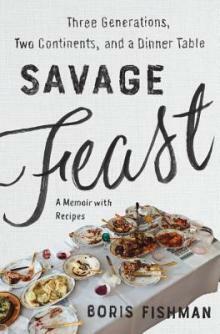 Savage Feast: Three Generations, Two Continents, and a Dinner Table. Boris Fishman was born in Minsk, Belarus, and immigrated to the United States in 1988 at the age of nine. His journalism, essays, and criticism have appeared in The New Yorker, The New York Times Magazine, The Wall Street Journal, and many other publications. His first novel, A Replacement Life, won the VCU Cabell First Novelist Award and the American Library Association’s Sophie Brody Medal, was one of The New York Times' 100 Notable Books, and was a Barnes & Noble Discover Great New Writers Pick. He lives in New York.